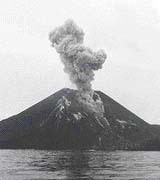 Anak Krakatau (Krakatoa) literally means Baby Krakatau. Though at over 300m above sea levels is it now larger than when Krakatau exploded in 1883. Indonesia’s Volcanology and Geological Disaster Mitigation Center of the Ministry of Energy and Mineral Resources still has Anak Krakatau on high alert due to increasing volcanic activity over the last few years. As recently as August 2008 the volcano has been spewing red-hot lava and thick smoke. Tourist boats are restricted to a 1km radius of the island.